After all the chocolate, chutneys, bucks fizz, mince pies, crisps and crackers I've eaten throughout the festive period I'm craving lots of green goodness! Don't get me wrong, I enjoyed every bite of all that delicious food but I've missed eating wholesome, nourishing goodness that's micronutrient dense and makes me feel physically and mentally amazing! I'm sure a lot of you are feeling the same as me (a little sluggish and bloated) and want a recipe that's going to make you feel brand new and ready to shine in 2017! Well, you're in luck, I've got the perfect thing! 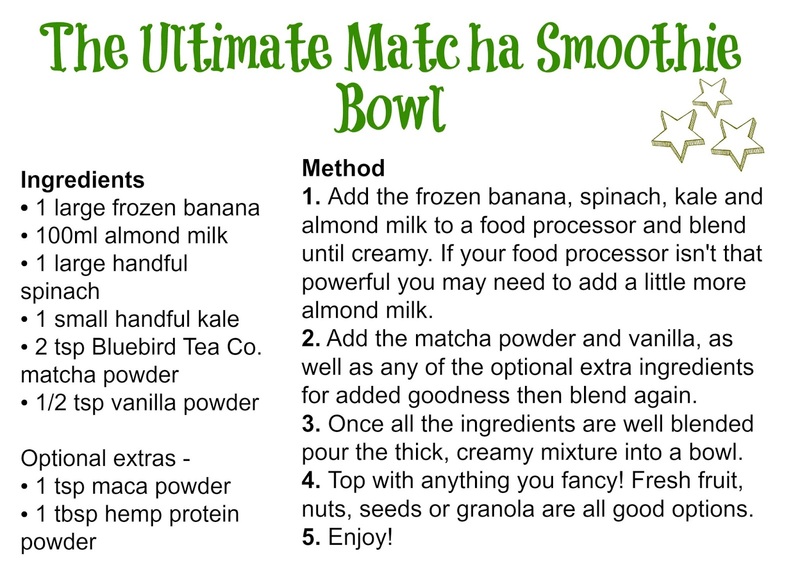 This matcha smoothie bowl feat. 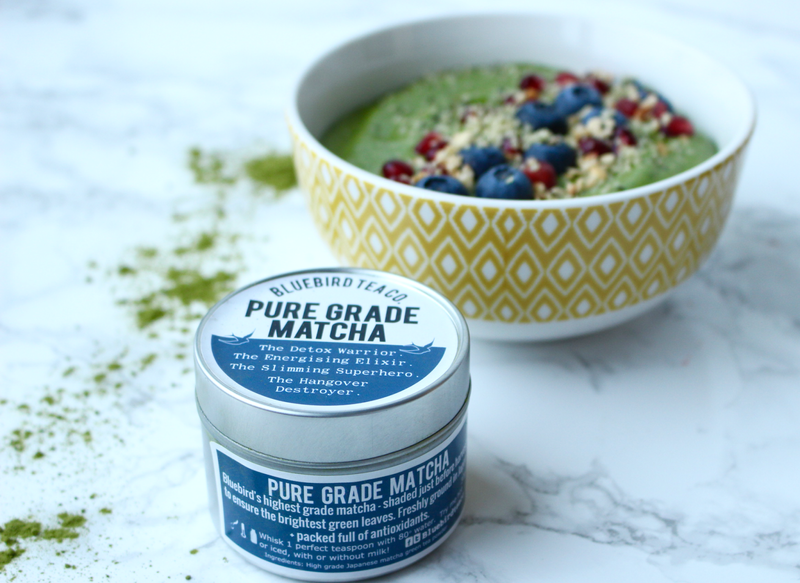 Pure Grade Matcha from Bluebird Tea Co. is the ultimate recipe to fill your body full of nutrients, boost your energy levels and beat the bloat. Adding matcha powder into your diet is a fantastic thing to do all year round but it's especially beneficial in the New Year when our body perhaps needs that extra bit of goodness and a little more antioxidant power. Choosing a pure grade matcha powder like this pot of amazingness from Bluebird Tea Co. ensures you're getting the highest quality matcha that's not lost any of it's natural goodness through production and it tastes so much more pure and rich too! Bluebird Tea Co. Pure Grade Matcha is nick-named - the detox warrior, the energising elixir and the hangover destroyer, so it really is perfect for January isn't it! Make sure you buy your pot here. 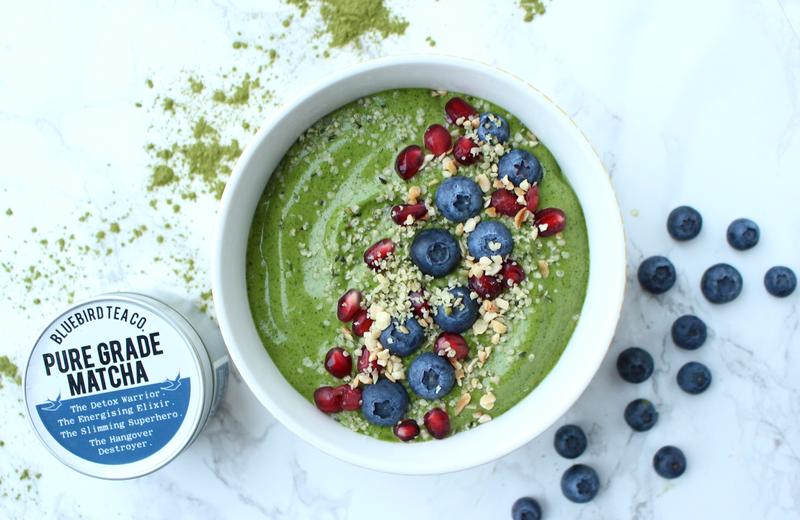 This smoothie bowl combines powerful matcha with greens such as spinach and kale to get your body bursting with goodness, loading those vitamins up, hydrating your body and helping to boost your mood and rid yourself of January blues too. Plus....it tastes so delicious, creamy and sweet (thanks to the ripe banana!). Win win!